Nyhavn - the New Harbor - is a 17th-century waterfront, canal and entertainment district, stretching from Kongens Nytorv to the harbour front just south of the Royal Playhouse, it is lined by brightly coloured 17th and early 18th century townhouses and bars, cafes and restaurants, which are all terribly overpriced tourist traps. The view is stellar though. 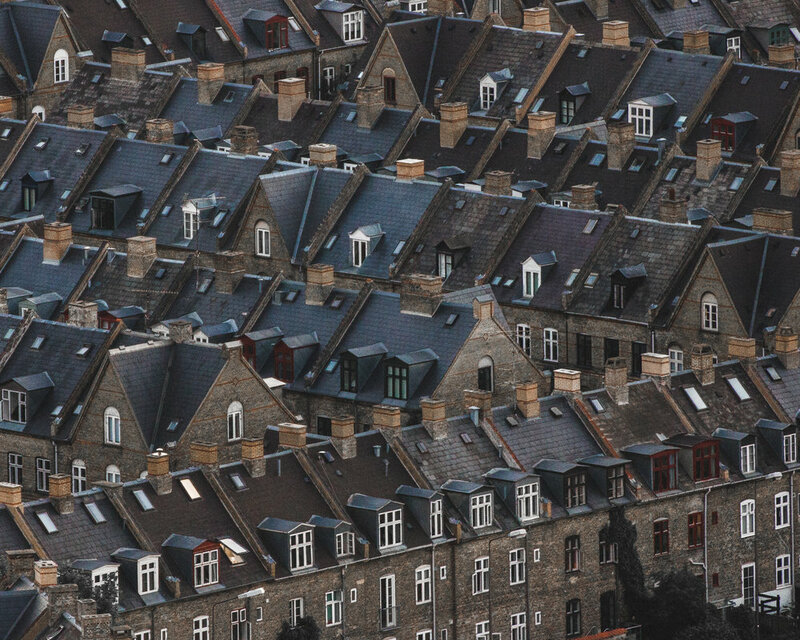 The red roofs of Copenhagen, with the dome of the Marble Church in the center. This ceiling is found beneath the stage tower of the Royal Theater, and above the street "Tordenskjoldsgade". Its actually a mosaic, created with around three million pieces from glass factories in Venice. You might be tempted to think that it depicts some sort of religious figures, but they're actually some of the historical giants of Danish art: Poet and playwright Adam Oehlenschläger, author H. C. Andersen, author Johannes V. Jensen & conductor, violinist and composer Carl Nielsen. You'll also find four mastodonts of science, namely astronomer Ole Rømer, physicist and chemist H. C. Ørsted, engineer Valdemar Poulsen & physicist Niels Bohr. But, wait, what? Scientists?! I thought this was a place for the arts! And quite right, but these four all made contributions to one of the great mediums for the consumption of art: The radio. The mosaic was created by painter and illustrator Ejner Nielsen, and took eight years to complete, starting in 1932. Trekroner Søfort in the foreground (literally Three Crowns Sea Fortress) at the entrance to the Copenhagen harbour, with Danish windmills in the middle, and the Turning Torso building in Malmö seen in the distance. 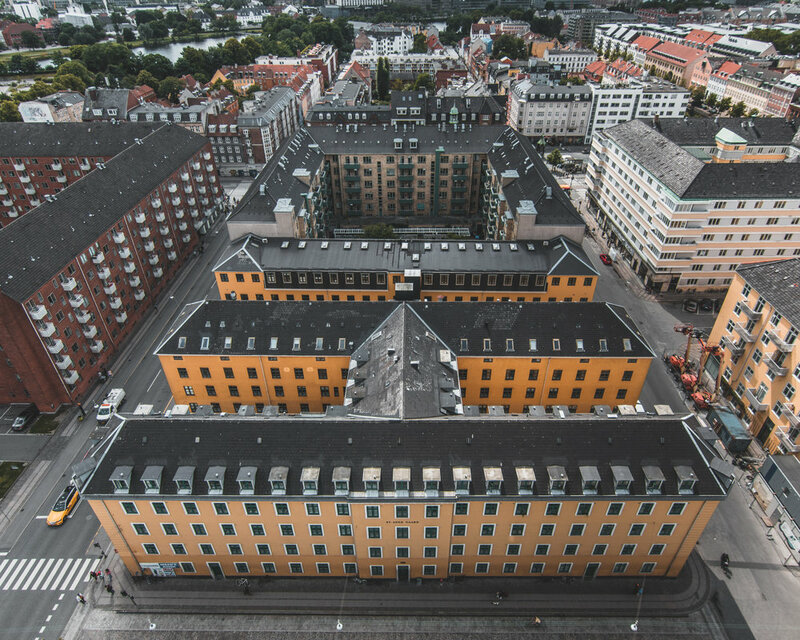 Christianshavn as seen from the top of Church of our Savior, at a height of around 80 meters. 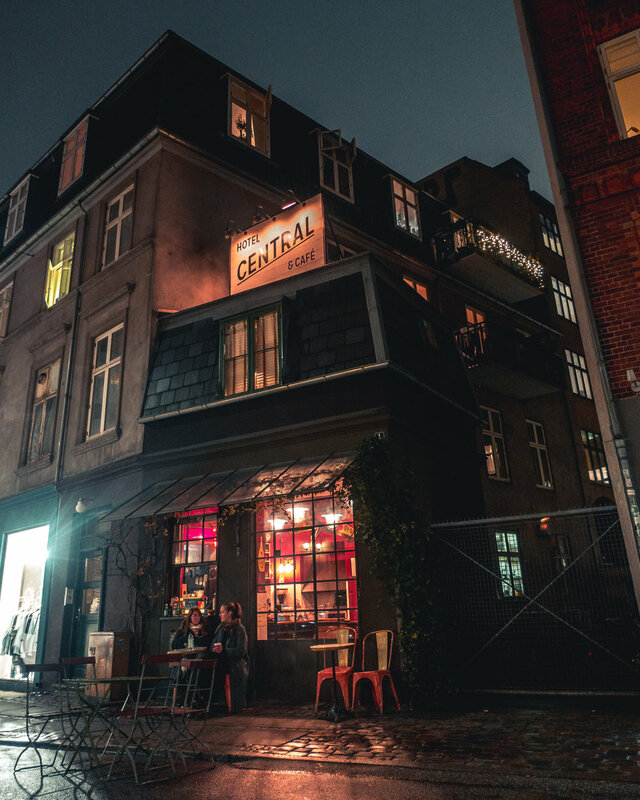 An icon of Nørrebro, these rooftops have been decorated with neon signs since 1953, to the joy of some, and to the chagrin of others. Middelgrunden is an offshore wind farm in the Øresund 3.5 km outside the city. When it was built in 2000, it was the world's largest offshore farm, with 20 turbines (2 MW Bonus each) and a capacity of 40 MW. The farm delivers about 4% of the power for Copenhagen. The Cisterns under Frederiksberg Gardens used to house the city's water supply. Now it houses a museum of installation art. Seen here is an installation by Olafur Eliasson. 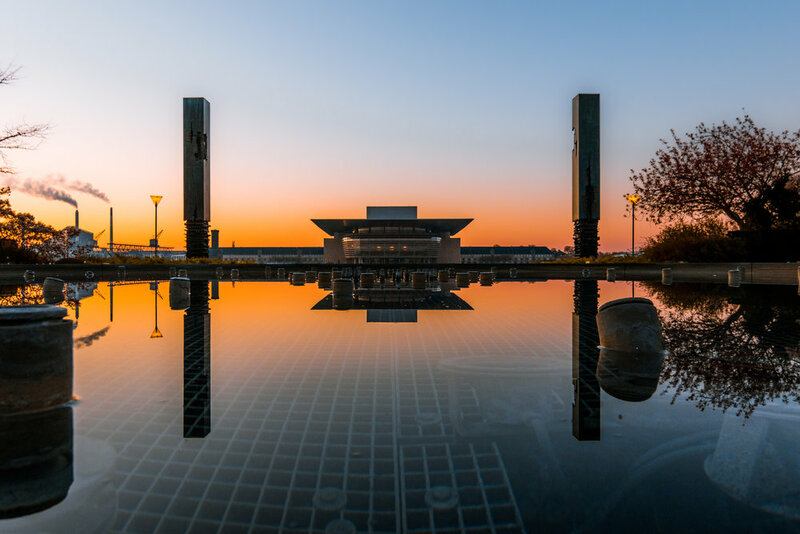 The Copenhagen Opera reflected in the dormant fountain in the Amalie Garden, on a calm windless morning in late April 2017. Nyhavn - "New Harbour" - the waterfront district of Copenhagen, with one of the many ships and boats the line the banks. Kastellet - the Citadel of Copenhagen - a favorite spot for runners and joggers. It is one of the best preserved star fortresses in Europe, and is still in use today. 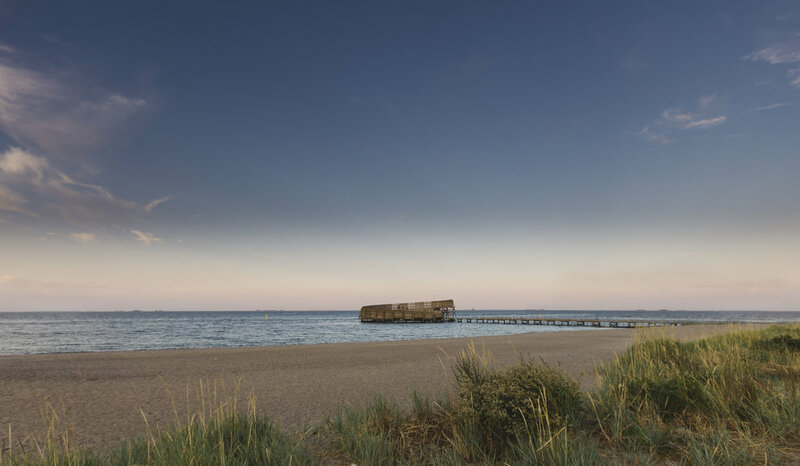 While it is open to the public, and used very much by the public, it is still an active military installation. The Royal Palace in Copenhagen, home of the Royal Family of Denmark. This is one of my favorite places in the city, especially in the morning when the city is still asleep. Memorial to the Danish-Norwegian naval hero Iver Huitfeldt, in Langelinje Park. This was shot in late April 2017 when the cherry blossom trees were in full bloom. At Amalienborg Palace there is a 24/7 detachment of guards from the Guards Company of The Royal Lifeguards of Denmark. 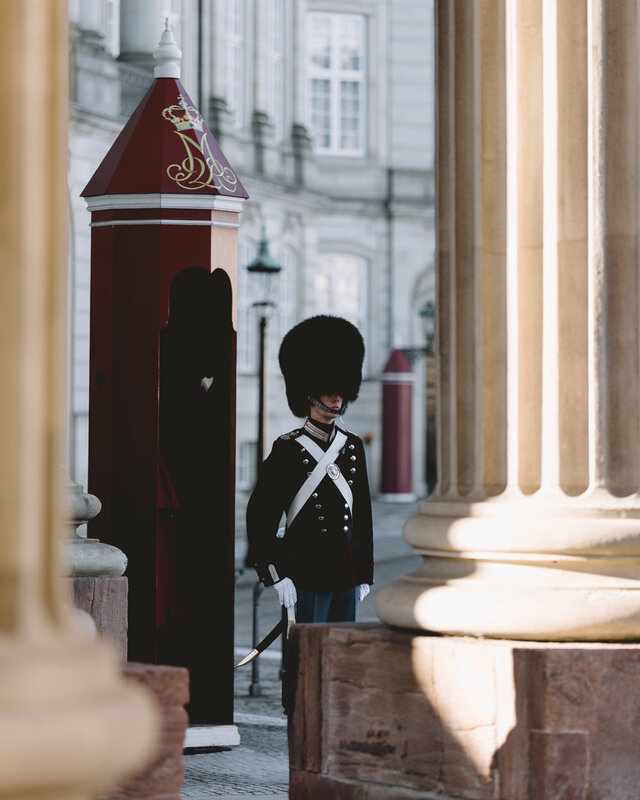 While the Royal Life Guards have two mechanized infantry battalions actively serving in the armed forces of Denmark, the Guards Company at the palace consist most of conscripts doing their national service. The Round Tower, built in 1642 under the legendary King Christan IV. 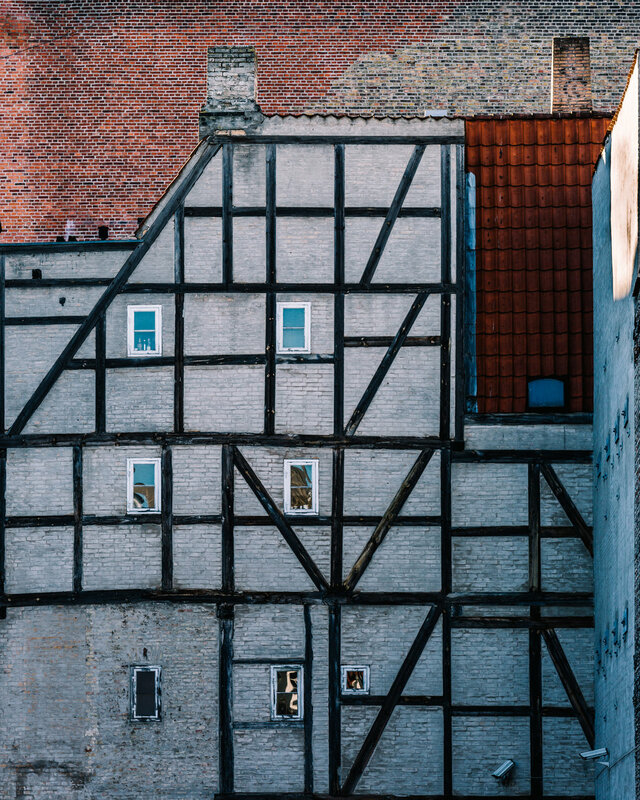 It was originally built as an astronomical observatory, and today provides on of the best views of the city center. Sunrise on a clear July morning. Worth getting up at 4:30 AM for. Established in 1903, Bispebjeg is the youngest of the five municipal cemeteries in Copenhagen. 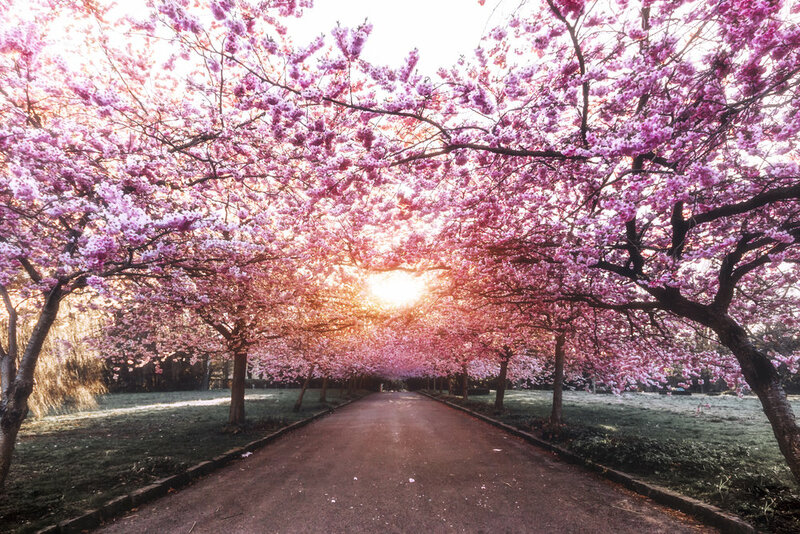 Aside from functioning as an active cemetery, it also houses this cherry blossom avenue, which triggers an annual pilgrimage to the site for locals and tourists alike. Another project by legendary King Christian IV, Rosenborg is a renaissance castle in the middle of Copenhagen. Today it houses the Royal Collections, which count among them Crown Jewels of the Kingdom of Denmark. While not formally a part of Copenhagen, Frederiksberg is a part of the Capital Region of Denmark. It is an autonomous city within the city of Copenhagen, and the only township in Denmark to be complete surrounded by another township. This is the Chinese Pavillion in the Frederiksberg Gardens on a snowy day in early 2017. In the Kalvebod Commons just outside the city, near Copenhagen Airport, nature flourishes. Here you can find a wide variety of birds, plenty of deer, sheep, and even a few horses. Marshlands at the Kalvebod Commons in Amager, with a herd of deer in the distance. The National Aquarium of Denmark, popularly called The Blue Planet, in Ørestad by the coast of Copenhagen. 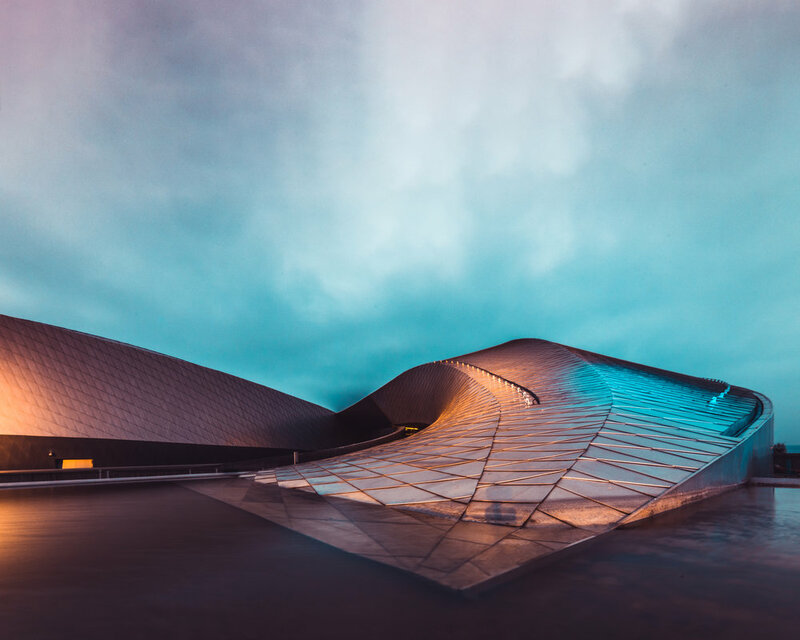 The aquarium opened in 2013 and is the largest aquarium in Northern Europe, and in my opinion one of the architecturally most interesting. A plane coming into Kastrup Airport to land, caught between the pylons of the Øresund Bridge. A lone crow rests in a fallen tree on the Kalvebod Commons on a misty sunday morning. A still from a foggy morning in Vestamager, the residential and commercial are bordering the Kalvebod Commons. A newcomer on the Copenhagen scene, Royal Arena is a newly opened concert venue, with space for 13.000 guests for sports events, and 16.000 guests for concerts. Bust by Carl Martin-Hansen to commemorate Princess Marie of the House of Bourbon, Princess of Denmark and Orleans. This can be found on Langelinie close to The Citadel. On this particular evening, the light cloud cover and the light pollution from the city gave an amost aurora like appearance. The Amalienborg Square with the Marble Church in background, on a cold wet night. From the iconic folktale by Hans Christian Andersen, this the equally iconic bronze statue by Edvard Eriksen in the harbor of Copenhagen. A full moon evening view of the Copenhagen Opera House. Rains earlier in the day results in a misty evening, which in turn produced this funky looking lens flare from the full moon. 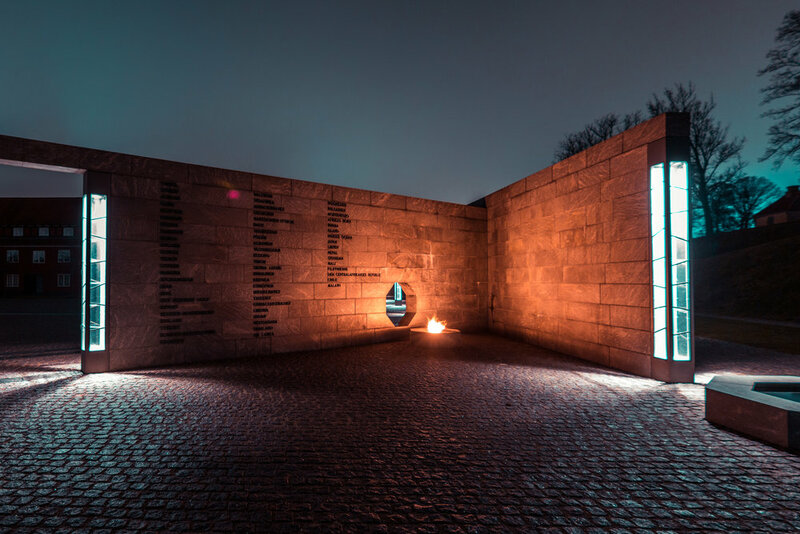 The Monument to the Danish International Efforts after 1948, bearing the names of the places Danish solders have fought, as well as the names of those who have fallen in combat for their Fatherland. 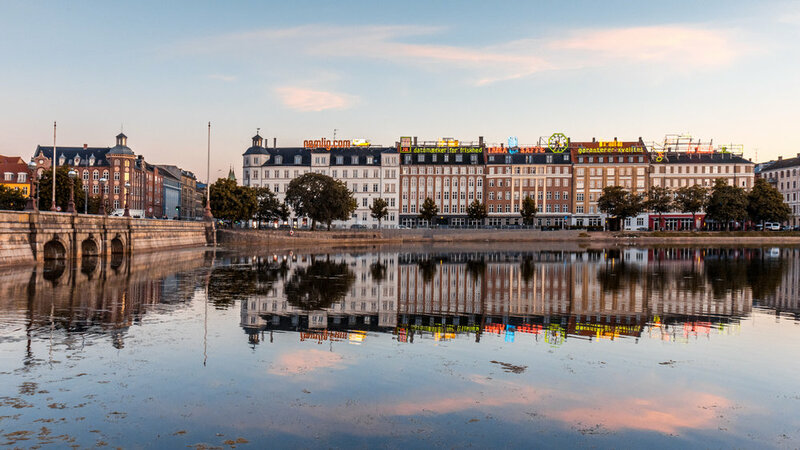 An Instagrammer favorite in Copenhagen, these are the neon signs at the inner city lakes. 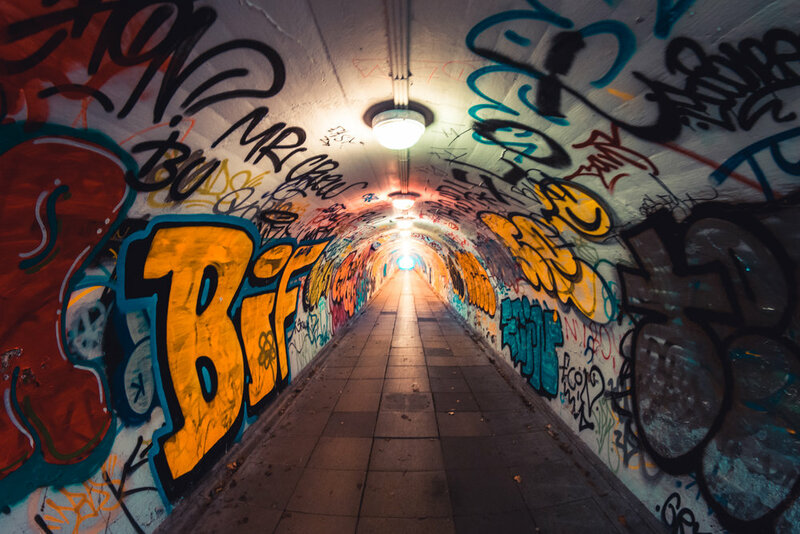 The tunnel under the railroad tracks at Otto Busses Vej may very well be the most graffitied place in Copenhagen, and the only place where I hope they never remove it. 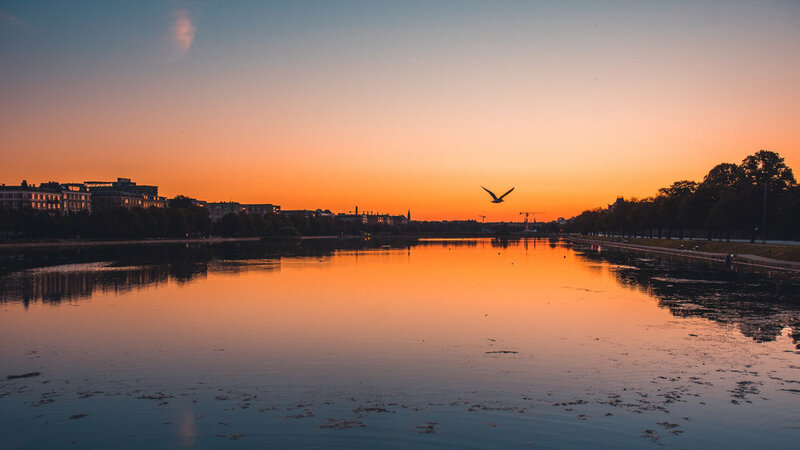 The inner city lakes in Copenhagen are a regular haunt for the national animal of Denmark, the mute swan. You can often find an army of them floating about. The Planetarium at the southern end of Sankt Jørgens Lake, named after astronomer Tycho Brahe. The planetarium has an IMAX theater, as well as a digital system which can show more than 10,000 stars. The Copenhagen Cathedral as seen from the inside. 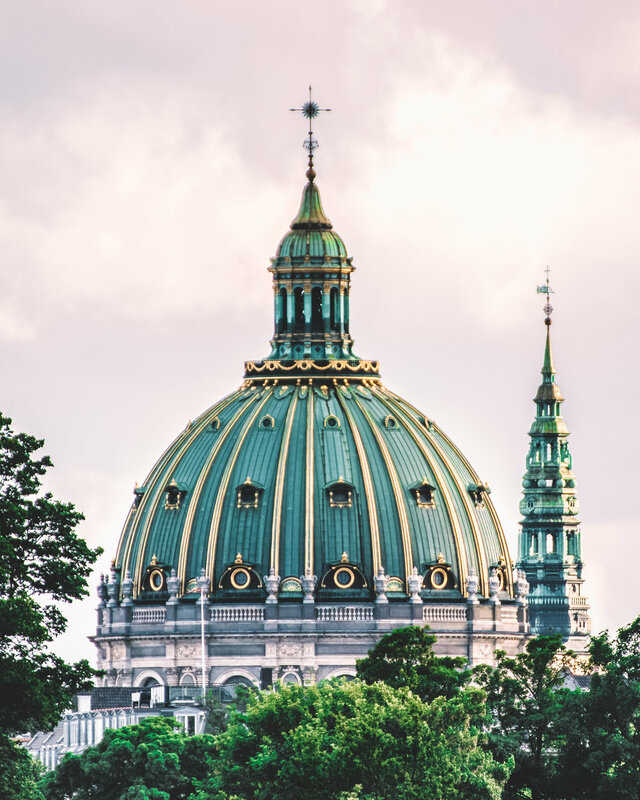 The present day version of the church was designed by the architect Christian Frederik Hansen in the neoclassical style and was completed in 1829. The vaulted ceilings of the exit towards Vesterbrogade, always a busy place with loads of people coming and going. 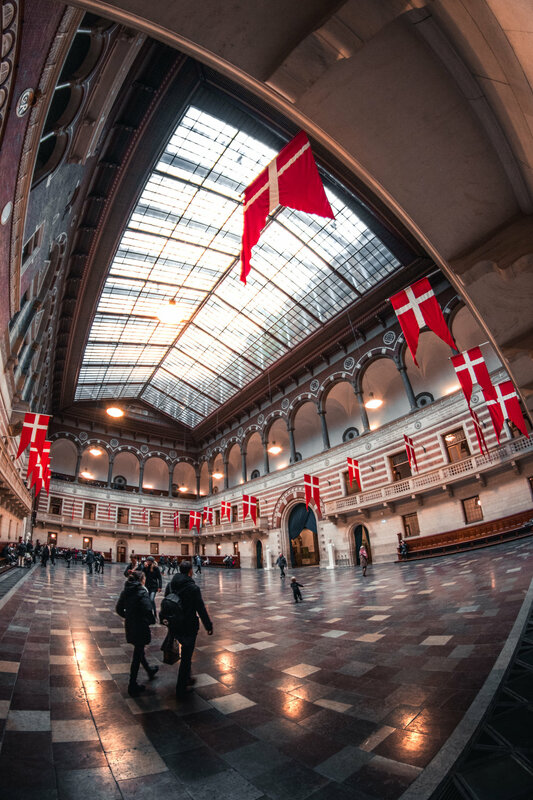 Inside the main hall of the Copenhagen City Hall. The headquarters of the municipal council as well as the Lord mayor of the Copenhagen Municipality, the building is situated on The City Hall Square in central Copenhagen. The Dragon Fountain located in the City Hall Square, with City Hall itself in the background. It was designed by Joakim Skovgaard in collaboration with Thorvald Bindesbøll and features a bull in combat with a dragon. Christmas decorations on Øster Fælled Torv in December 2016. 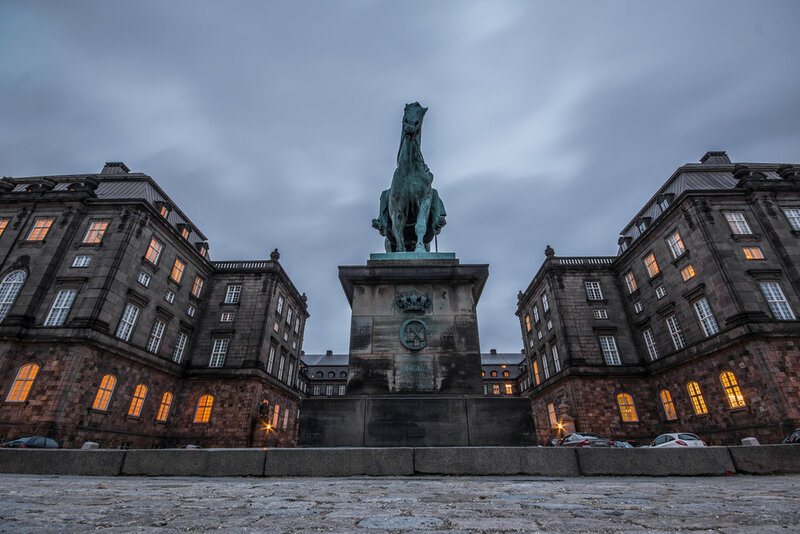 The monumental equestrian statue of Amalienborg's founder, King Frederick V in the middle of Amalienborg Square, set against the dome of the Marble Church. The Guards Company during a change of the guards. In sun or rain, cold or warmt, I don't think Amalienborg ever loses any of its charm. Frederick's Church - popularly called the Marble Church - seen down Frederiksgade from Amalienborg Square. Due to its impressive size and beauty, many people mistakenly assume this to be a cathedral, which it is in fact not. Christmas decorations on a balcony in the Vesterbro neighbourhood of Copenhagen. A a hotel with only one room, and a teensy tiny café under it. Funny little place that you can find on Tullinsgade. The Royal Audience rooms in Christiansborg Palace. 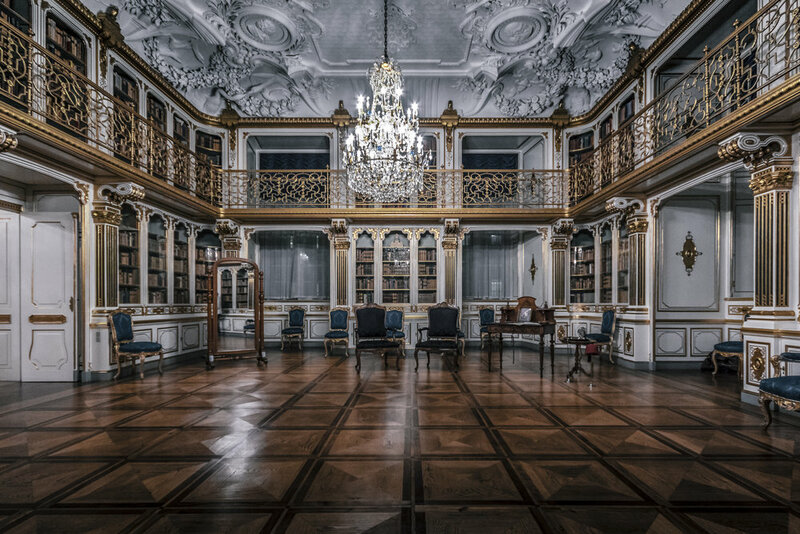 The private library of Her Majesty Queen Margrethe II of Denmark, in Christiansborg Palace. Nørreport Station, one of the busiest in Copenhagen, connecting both regional trains, S trains, metro, and bus service. The Hotel Astoria with the Copenhagen Central Station in the back. The building is an early example of Functionalist architecture, designed for the Danish State Railways by Ole Falkentorp to resemble a locomotive. The Vesterbrogade exit of Copenhagen Central Station, as seen from Vesterbrogade. The ceiling of the entrance hall of the Copenhagen Central Station. The Liberty Column, located in front of the Central Station in Copenhagen. Its a 20 meter tall obelisk erected in memory of the peasant reforms in 1788 which led to the abolition of serfdom. Axeltorv with the sculpture "The Seven Axex" by Robert Jacobsen in the foreground, and the new addition of the golden Axel Towers behind. The new parking house in the Århusgade neighbourhood, looking super sci-fi'ish. Cruise Ship docked at Langelinie Quay, with one of the smaller boats from the Free Port of Copenhagen passing in front. S-Train arriving at one of the tracks at Copenhagen Central Station. The Queen Louise Bridge, popularly called "The Hipster Bridge", a favorite haunt of beerdrinking locals when the sun is out. Bicyclist a full speed passing under the Queen Louise Bridge. Nørrebro station on the S-train’s Ring line. It serves the outer end of the infamous/famous Nørrebro district. 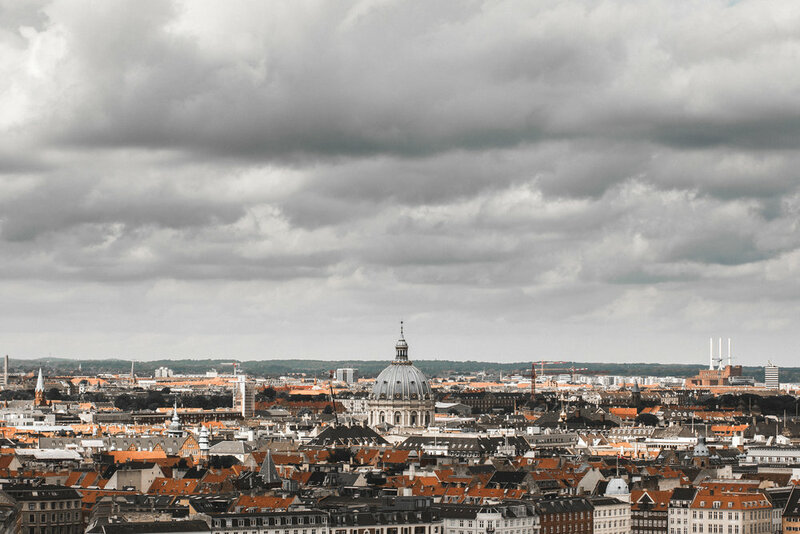 The skyline of Copenhagen with the dome of the Marble Church dominating the centre. Inside the Nørrebro Station. 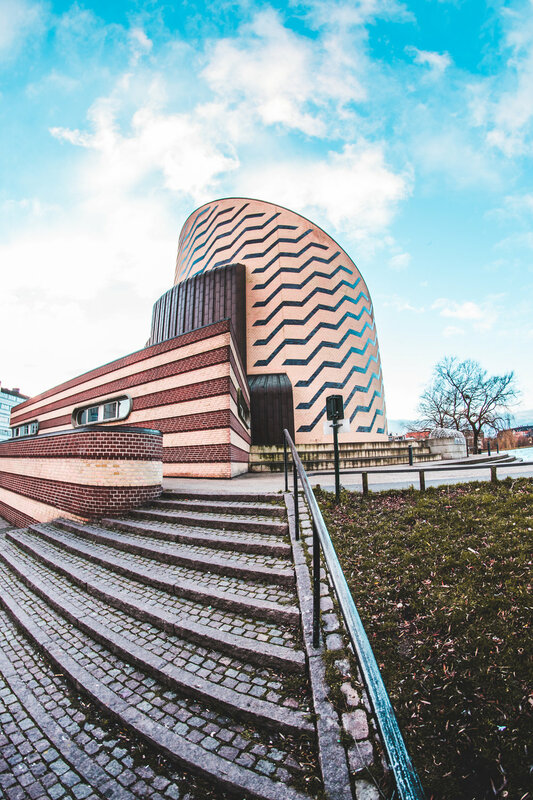 The building is from 1930 and was designed by the Danish State Railways' head architect K.T. Seest. Popular among runners, Østerbro Stadium is a combined football and athletics stadium. It is the home of the football clubs Boldklubben af 1893 and BK Skjold and it is also the home stadium of the athletics clubs Københavns Idræts Forening and Sparta. It has a capacity of approximately 7,000 guests. The "Chinatown" section of the Tivoli Amusement Park in the city center. A poor bike, rescued from the depths of the Copenhagen inner city lakes. Colorful houses along the banks of the inner city lakes. The new entrance connecting Copenhagen Main Street directly with Nørreport Station. Copenhagen Main Street, on a beautiful Christmas morning. This is usually one of the busiests spots in the city, but on this Christmas morning it was dead quiet. Sunrise over one of the Harbour Bus stops along the Copenhagen harbor, specifically the Nyhavn stop. The Red Square, part of Superkilen on Nørrebro, a place that is always bustling with activity. Jetty at Utterslev Mose, a bog area just outside the city. Excellent place to enjoy a sunset with a book and a cup of coffee, provided you bring your own. 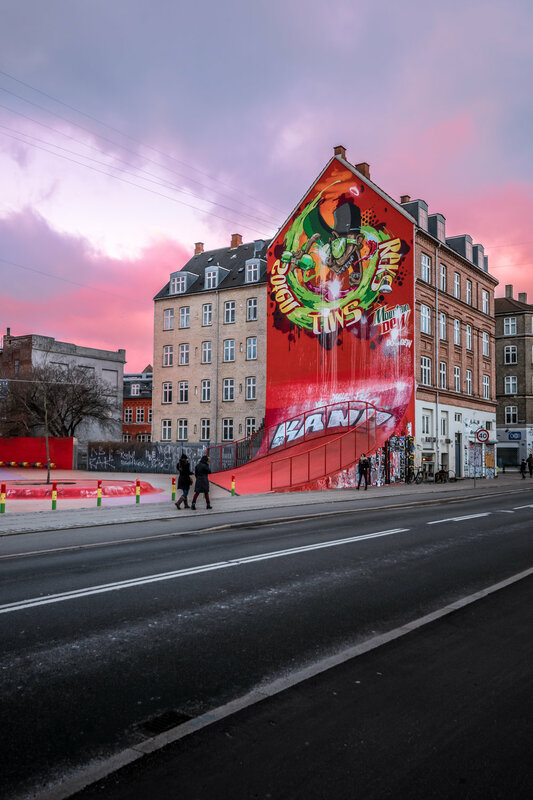 Another part of Superkilen, and an absolutely darling on Instagram, this place has quickly become an icon of Nørrebro. Sankt Annæ Gade seen from the top of the Church of our Savior, at a height of about 90 meters. Rental boats in Frederiksberg Gardens, on a beautiful autumn afternoon. Taking a moment out to read a book in the Frederiksberg Gardens. Taking a breather in the sun, in front the Royal Danish Academy of Music Concert Hall. Bicyclist passing in front St. Mark's Church at the end of Julius Thomsens Plads in Frederiksberg. The church was built from 1900 to 1902 to the design of Carl Lendorf. It was consecrated on 9 November 1902 at a ceremony attended by Bishop Kultus Minister J. C. Christensen. A tree in the Tivoli Amusement Park, lit up as park the years Christmas decorations. One of the terminals at Copenhagen Airport, nicknamed "The Whale" for its resemblance to a whale skeleton. Kayaks are becoming an increasingly more common sight in Copenhagen, as here next to the Opera House. One of the rather unique looking lamps hanging in the lobby of the Copenhagen Opera House. Entrance to Forum Metro Station in Frederiksberg, allowing easy access to the Forum Conference Center next door. The Japanese Tower in Tivoli Amusement Park, situation right next to the Dragon Boat Lake, and housing an Asian restaurant. Dragon Boat lake, with the Japanese Tower reflected in the pool. Tivoli Amusement Park's Moorish Palace, which today houses Nimb Hotel & Restaurant. A the family of lions at Copenhagen Zoo, with the top of the cubs heads just sticking up above the leaves. Two City Halls in one, with the tower of Copenhagen City Hall in the foreground, and the tower of Frederiksberg City Hall in the back. In the middleground you can see Axel Tower, one of the newer additions to the city center. Tiger at Copenhagen Zoo, with a look that makes me think all he sees is a steak with a camera. Kiosk at Nørreport station, in the dead of night. Nørreport Station after dark, with the iconic neon sign reflected in the wet tiles. Nørreport Metro Station entrance, showcasing the distinct grey design of the Copenhagen metro. Library of the University of Copenhagen. The elephant gate at Carlsberg City, another classic Copenhagen landmark. School students on their way home from school, crossing Teglværksbroen in the Sydhavn district of Copenhagen. Royal Life Guards during the daily ceremonial change of the guard, at the Royal Palace. Everyday at noon you can witness the change of the guard. Long exposure funtimes at the Bridge of Lights crossing the inner city lakes. The Chinese Pavilion in Frederiksberg Gardens, on a brisk spring day. Metro train above the ground at Femøren Station. Kastrup Sea Bath on a late autumn morning. The very recognizable Bella Sky Hotel in Ørestad. Bridge across the railway at Femøren Station, lit up after dark. The Øresund Bridge with one of the many ships passing through the Sound every day. Overpass near Dybbølsbro Station. This area is currently undergoing extensive contruction, and will in future lay ground to a huge furniture megastore. T'was a cold and stormy night, when this shot of the Parliament of Denmark was shot. The first King from the line of Glücksburg, Christian IX, has this swanky equestrian statue at the riding grounds at the Parliament of Denmark. The view of Copenhagen from the new Bohrs Tower at the Carlsberg City. Humleby ("Hop's Town") is an enclave of terraced houses next to the Carlsberg area in Vesterbro. They were built between 1885 and 1891 by the Worker's Building Society to provide healthy housing for the workers at Burmeister & Wain. Here it is seen from the top of Bohr's Tower in Carlsberg Byen. The view straight down Istedgade, with Copenhagen Central Station at the end of the street. The Eslanade, pretty much synonymous with the headquarters of the Mærsk conglomerate, the building which is seen here. Its also where the Royal Ship "Dannebrog" docks. The Royal Yacht "Dannebrog" - or at least its stern - with the guardhouse of Holmen Naval Base in the background. The Dome of the Marble Church, with the Nikolaj Church tower in the background. Equestrian statue of Frederik V, by the Grace of God, King of Denmark and Norway, the Wends and the Goths, Duke of Schleswig, Holstein, Stormarn and Dithmarschen, Count of Oldenburg and Delmenhorst. In the background you can see the facade of the Copenhagen Opera House. The moon on a July morning, setting over the Lakes. Coloquaially known as the "Hipster Bridge", for its high number of hipsters with boomboxes. This area used to be a landfill, but was converted to a park between 1937 and 1939, and opened to the public on September 1, 1939. Due to fuel shortages during World War II, much of the park was dug up in 1941–42 to search for coke, though the park was re-established and expanded during 1944–52. The park was officially designated as a protected area on May 3, 1966. Søndermarken is a park in Frederiksberg, and features this Chinese pavilion. The current building was built on top of the remains of a former one, which itself had been rebuilt many times over. The first was built in 1787 when the park was redesigned as an English garden, but by 1802 the first pavilion had fallen into such a state of disrepair that the decision was made to build a new one yet again. On hot days, some Copenhageners swim with the city's skyline in free view. The quality of the water is checked daily and has to b approved by the authorities before swimmers are let in. The pool was closed in October when this was shot, but during the winter period you may catch a glimpse of local winter bathers. There are plenty of bikes in Copenhagen, and on this tree covered road next to Valby Park it is no different. Rain or snow, day or night, bikes are everywhere. The Sydhavn - or South Harbour - district of Copenhagen as seen from the air, just above Valby Park. The Poplar Lane at Valby Park, with the sunset and Avedøre Power Station in the distance. A Copenhagen icon, the Royal Life Guard at Amalienborg Palace, with the bearskin hat and its easily recognizable ceremonial uniform. The bearskin dates from 1803 and is decorated with the regiment's bronze cap badge. Symbolic infantry sabers are carried by the rank and file, as you can see here. These were part of the spoils from the First Schleswig War of 1848–1850 and were originally derived from a French infantry weapon. Sometimes old buildings need to be knocked down, and they leave their marks. Here we see what remains when you remove half of a building.